Re-Seat Your Antique Chair Today! 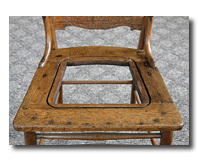 Learn how to re-seat your antique chair with these how-to books and booklets. 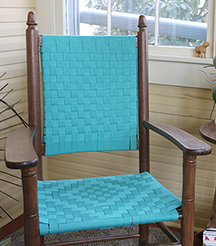 If your chair has a groove around the seat opening, then choose Cane Webbing. Reed Spline (circumference of groove + 1 foot). See chart below for Reed Spline sizes. RS70F # 7 Spline 5/32"
RS75F # 7.5 Spline 11/64"
RS80F # 8 Spline 3/16"
RS90F # 9 Spline 7/32"
RS95F # 9.5 Spline 1/4"
Caning pegs, caning awl, caning chisel, caning needle, wedges, glue, tacks, nails, etc. is used for chairs that have a series of holes around the seat opening. Consult the chart below to determine the correct size Chair Cane for your chair. Don't need 1000 feet of chair cane? Don't need 250 feet of chair cane. Buy only the feet you need. 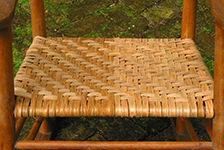 Chair Cane, the outer bark of the rattan palm vine, is used for chairs that have a series of holes around the seat opening. Great choice for modern chairs, stools and benches. Laced and Unlaced. a traditional chair seating material, is beautiful and long-lasting. Limited supply. Free Online Instructions for using Hickory Bark in your chair. Opens in new window. Strong, bonded fiber with detailed (pressed) designs. 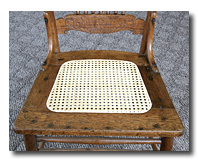 Weave a chair seat in the classic tradition of the Shakers using the Best Quality 100% Cotton Webbing available. See colors below. Easy to use and strong. Choose one color or combine colors for a contrasting "checkerboard" pattern. W = Width of your bottom in inches at the widest point. This is usually across the front of your bottom. L = Length of your bottom in inches front to back. Order all yardage of one color or half the yardage in 2 colors. 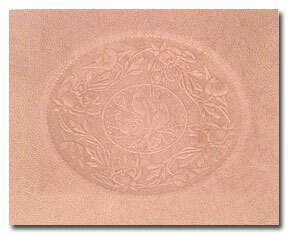 You will also need a piece of foam (listed below) for each chair, rocker or stool. Save $$$ with 1" Wide Value-Priced Cotton Webbing. A bit lighter in weight than conventional Shaker Tape, this 100% cotton webbing is 1" wide, economical, durable and available in a variety of contemporary colors. In addition to seating, this cotton webbing is a good choice for handles and accent rows in your baskets. See colors below. Easy to use and strong. 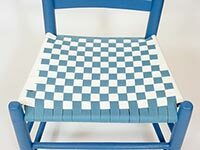 Choose one color or combine colors for a contrasting "checkerboard" pattern. 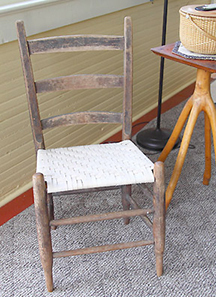 Re-Seat Your Antique Ladder Back Chair with Flat Reed. How much flat reed will I need to re-seat my chair seat(s) using the traditional herringbone weave? The answer is here: The Flat Reed Chair Seat Calculator. Free On-Line Instructions for seating your ladder back chair with Flat Reed. Made of Round Reed, these braids are used for repairing and trimming furniture (chairs, boxes, frames), baskets and other decorative items.